The tool boasts capabilities that meet or exceed those found in other tools on the market, while being easy to use and maintain - at a cost well below what can be found on the market today. Samples for electron microscopy often benefit from the addition of a thin film. It is typically a conductive material such as Pt, Pd, or Au. These conductive layers can help to inhibit charging, reduce thermal damage caused by localized beam heating, and improve the secondary electron signal. Traditionally these films have been grown using PVD techniques. As technology advances, some types of samples are not served by PVD because the features that need to be coated are not accessible to line-of-site growth. 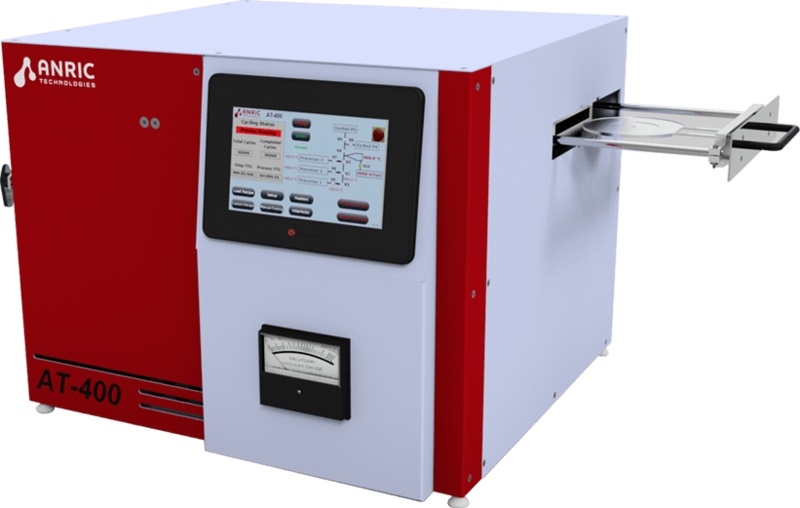 The AT410 ALD system provides a solution to conformal, conductive thin films for 3D sample prep while also providing traditional 2D coatings that are currently grown using sputtering/evaporation. The AT 410 not only pushes the boundaries, but is also an effective replacement for current sample preparation processes all within a benchtop configuration at a comparable price point. Shutoff valve on bottle is available as a ball valve or as a bellows sealed valves. Bellows sealed valve option is now standard. The AT410 ALD system utilizes an advanced PLC/HMI control unit with a high resolution 7” touchscreen display. The user would have complete control over the operation of the tool, recipe generation, and sensor data all through the easy to use and robust control SW interface. A standard AT410 can be attached to a glove box with a glove box adapter upgrade. The system is sealed to an open side of a preexisting or new glove box. Recipes can be written and saved directly on the touchscreen. A quick start recipe screen with default settings and fully customizable recipe input are available. Multilayer and multicomponent recipe control is also standard. Provided with an ethernet connection, the AT410 system interface can be connected to remotely by engineers at Anric Technologies for remote troubleshooting and software upgrades. Upgrade can also be performed using a standard USB drive connected into the communication hub built-in to the back of the tool. Lifetime SW upgrades are included in the base price of the system.